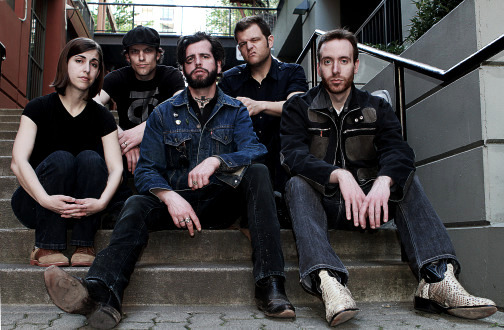 French Letters is a Seattle rock band that serves up a swaggering cocktail of take-no-prisoners guitar rock, blues and Americana. French Letters originated in the summer of 2009 when poet Michael Crossley was asked to perform at a friend’s art opening. Enlisting the help of a co-worker who played guitar, Crossley read his poems over John E. Naffah’s jazzy blues riffs. Excited by the success of their performance the duo asked their friend, Luke Steitz, to record at his studio. During the session Luke couldn’t help but jump on the drums and play a few songs with them, then mention that he had a friend, Michael Puglisi, who had his master’s degree in jazz guitar. Courtney Steitz was added on bass and the band was complete. They put together the tracks that became the 2011 released album, In Tongues. Shortly after, John E. left the band to focus on being a father and Connor O’Brien thankfully stepped in to fill the gap. French Letters has continued to evolve their sound into some seriously fun rock ‘n roll with their most recent release, No Evil Star, available at http://frenchletters.bandcamp.com. At the forefront of the group are the lyrics of Michael Crossley, whose writing style is at once forthright and visceral, yet vulnerable and beautiful. Guitarists Michael Puglisi and Connor O’Brien cull from a pallet of influences that range from gritty blues, rootsy Americana and the late, great rock ‘n roll to serve as the perfect obbligato to Crossley’s lyrics. The band is rounded out by the intensely dynamic rhythm section of Courtney Steitz’s driving, hook-laden bass lines and Luke Steitz’s authoritative back beat.